This standing wall fountain, made of cast stone, adds style and ambiance without taking up too much space. Campania International in Pennsburg, PA.
Wall fountains are perfect for small patios or courtyards because they add an element of relaxation and a touch of style without taking up much space. 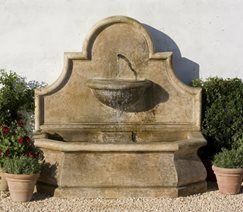 Whatever look you are going for - traditional, antique, modern or Asian - there is an outdoor wall fountain that will suit your tastes. If you can't find a prefabricated wall fountain that meets your needs you can have one custom made. There are two types of wall fountains: mounted and standing. Mounted wall fountains are small, self-contained units that hang on the wall. This type of wall fountain must be lightweight so they are typically made of fiberglass or resin that mimics stone. Standing wall fountains, sometimes called floor fountains, are large, have a basin that sits on the ground and a flat side that is placed against the wall. 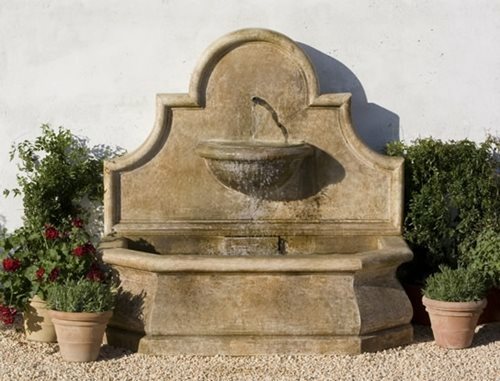 These types of fountains do not have weight restrictions and are commonly made of cast stone. Many landscaping professionals suggest a custom built fountain that will be integrated into a new or existing wall. This will require an experienced mason to build a water basin up against the wall and to install the necessary plumbing inside or behind the wall. A spout or fountain mask will also need to be integrated into the wall. Custom wall fountains have a very cohesive look because they are actually part of the landscape, rather than something that was added after.